Crown reduction, stump grinding, dead wood removal, shaping & pruning. Greensteds are NPTC qualified and fully insured to carry out all aspects of your tree work in the Chelmsford & Essex area to a very high standard. 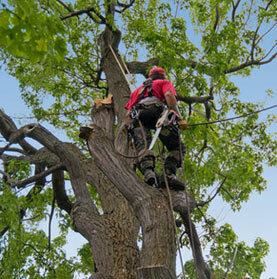 Using equipment such as rigging systems and the latest tree surgery techniques and knowledge, we can remove single limbs or entire trees from the largest of gardens to the smallest without the risk of damaging buildings or plants beneath. Our dedicated team cover all of Chelmsford and the surrounding areas as well as the whole of Essex. We take immense pride in our work and will go that extra mile to ensure that your garden is left looking as clean and tidy as it was when we arrived. Seasoned logs and wood mulch for sale and delivered within the local Chelmsford area - ring for prices. Thank you Greensteds for a great job. I'm delighted with the tree work you carried out and my neighbours have expressed their amazement at your tree climbing abilities! Garden was left spotless too. Will definatley be using your services again. These are some of the tree surgery tasks that we can carry out. Pruning back the ends of branches, reducing the crown of the tree to a more manageable size whilst retaining its natural shape. Selective removal of branches from the crown of the tree to increase light penetration. We are careful only to remove dead, dying or diseased wood from the crown of the tree with the purpose being to maintain its health and safety. We can remove your tree to ground level. We do this by taking the tree down in stages carefully lowering branches and timber to prevent damage to the surrounding area. To maintain the natural shape and balance of your tree or to encourage new growth. Some trees require regular and remedial pruning, of which there are various training methods including formative pruning, which is carried out on younger trees to encourage a balanced structure to be formed as the tree matures. The result being a well balanced, mature tree with a sound structure. The added benefit of this technique is that if kept up every few years the size and growing habit of the tree can be managed. We cut the heads of main branches back to promote a more bushy growth of foliage. This prevents them outgrowing their allotted space, casting shade, obstructing electric wires and streetlights or blocking gutters. The removal of tree stumps after felling to below ground level. We can grind any size of stump using one of our stump grinders to below ground level causing minimal damage to the surrounding area. If the stump is not in the way, we can poison the tree stump to prevent re-growth and allowing the stump to slowly decay. Trimming and shaping hedges to encourage thickness and maintain appearance. Email us or call us on 01245 248 484 to discuss your requirements. All work carried out in accordance with British Standard 3998. All operators are NPTC qualified.